Our Family Dinner marketing materials recently got a much needed facelift from Alex and Amanda, two of our customers who are also super talented designers. 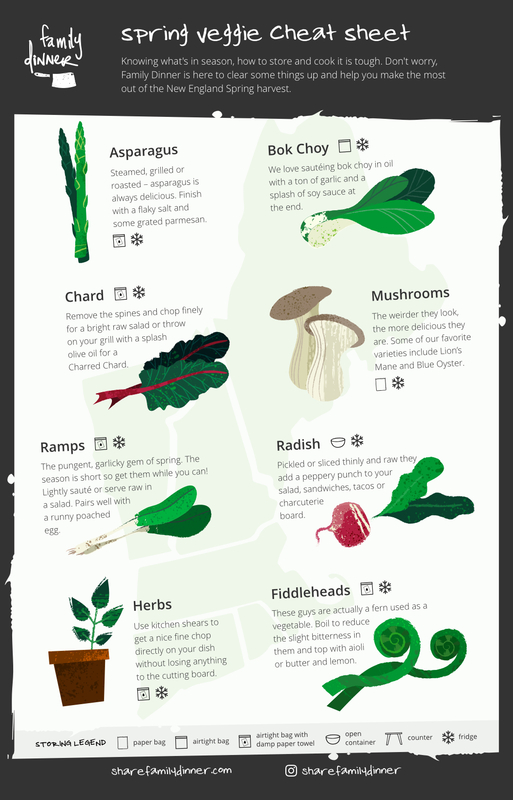 This fresh, clean design is a are Spring Veggie Cheat Sheets, telling how to prep and store the bounty ahead. We wanted the materials to be a bit like the emails; informative, a little bit quirky and totally gaga over fresh produce. These beautiful, fridge-worthy postcards will be part of series from the design duo. Check our their amazing work at sparkyart.com and alexmaeder.com. Butter Braised Rib Eye: Yes, we have included this recipe before, but why mess with perfection? If you're feeling intrepid- throw on your snow suit and fire up the grill. Otherwise, your cast iron will be just dandy here. Blue Cheese Sauce: This is another repeat idea that tags along with the braised Rib Eye. To impress the buddies you had to invite over to nom that huge steak, may we suggest going over the top with a blue cheese sauce? Tim dips potato chips in his and there is barely enough left for dinner. Martha's French Toast: Martha tells us how to use day old bread for this classic breakfast treat. She cooks and she's best buddies with Snopp Dogg - I couldn't love her more. She calls for a splash of cognac here, which you could omit. Or replace with bourbon. Go on. Live a little. Sweet Potato Hash: A perfect side dish for your steak. If there are left overs, throw them in the cast iron in the morning and crack an egg over it. Heat up the left over tortillas if you have them or mop up your greasy egg with sweet toasted brioche. Voila. Brunch is served. Baked Red Fish on the Half Shell: Here the 'half shell" is a reference to the skin which you can leave on for baking, and choose to keep or discard for service. This is crying out to be baked in garlic and butter. Once you remove the cooked fish from the pan, pour the pan juices over the fish before service. That flavor is gold. Don't you ever dare pour it down the drain. Garlic, and its nom de plume, the "stinking rose" is at the core of cuisines around the world. Most of the fresh garlic sold in the US comes from China and nearly all of the pre-peeled and pre-chopped varieties are also imports from more than 7,000 miles away. The garlic in this week's share comes from Busa Farm in Lexington, MA. When things are picked and the distance they travel have a direct impact on their flavor. We expect the bulbs from Busa to pack more of a garlicky punch that will be pleasing to your taste buds but doesn't mean anyone is going to want to smootch you any time soon. Chopping like a Champ: Let Jaime Oliver's mate Pete talk you through how to peel, smash and chop garlic like a pro. Butter on Demand: Garlic butter belongs on everything. Here's how to make it in advance and store for future stinky, delicious use.